makes even moderate Republicans' skin crawl. anoint Minnesota Congresswoman Michelle Bachmann their Great White Hope. Less than 24 hours later Tim Pawlenty, perhaps the sanest hopeful in the place next to Jon Huntsman, tossed in the towel. Apparently intelligence, sanity and moderation are not qualifications for being a Republican president these days. Let's start with Pawlenty. In assessing the landscape objectively and without partisan rancor, and despite that I disagree with much of his views, the guy probably would've made a decent president, or at least the kind who wouldn't keep me up at night worrying about America's moral destruction. But unfortunately for T-Paw he doesn't fit the Crazies' fantasy image of the Republican Alpha Male. To their naked eye, he kinda looks and sounds more like their stereotypical image of a liberal. You can almost see him behind the wheel of a Volvo, his Bierkenstocked foot resting on the foreign pedal. Which brings us to the GOP's newest boy-wonder, Texas Gov. Rick Perry, who fits the Alpha Dog profile with his folksy drawl, cowboy boots, pick-up truck and general swagger. When he's not talking to God he's busy promising voters that he'll "make Washington, D.C. as inconsequential in your life as possible." I wonder if that pesky little government involvement he'd like to rid Americans of includes Social Security, Medicare, Medicaid, Veteran's benefits, the Post Office, the Centers for Disease Control, the National Weather Service and even the military? Or are those the "consequential" aspects of government; the "good stuff?"? This is a politician who's running for the highest office in the land, yet an office and a government for which he has zero respect and appreciation. A governor who's wanted his state to secede from the Union. It's hard to convince voters you should be president of the "government" you so clearly disrespect. But as I keep saying, Rick Perry has about as much chance of becoming president as Katie Perry. Now onto Bachmann, who is very likely to slug it out with Perry these next many months for the Crazy vote while Mitt Romney sits back and watches, and benefits from, the train wreck. 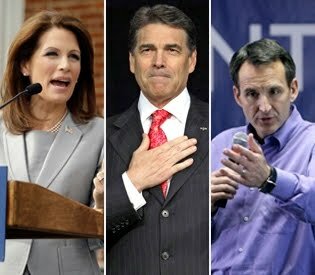 You can be sure Bachmann and Perry are gonna rip into each other like "The Real Housewives of New York." Bachmann hit the Sunday morning talk show circuit and was in rare form. Gotta give her credit: she is a master at staying on point and evading virtually every question while coming off over-rehearsed, robotic and lacking substance...and with her usual mangling of the English language. On CBS's "Face the Nation" she boasted that "I have been taking my message all across Iowa, and people resonate with that message." Sorry Michele, messages resonate, not people. But then again what do you expect from a woman who thinks the historic Shot Heard 'Round the World was in New Hampshire? On NBC's "Meet the Press" host David Gregory appeared as frustrated with her evasiveness as if he were talking to a tight-lipped 15-year-old. He played the clip of her talking about her husband Marcus's influence in her life: "My husband said, 'Now you need to go and get a post-doctorate degree in tax law.' Tax law? I hate taxes. Why should I go into something like that? But the lord said, wife, you are to submit to your husband." She insisted that in her marriage being "submissive" means being "respectful." Gregory was incredulous as he suggested that that kind of "respect" would never fly with his wife. On "Fox News Sunday" with Chris Wallace she was outed for appearing to support Obamanomics. Wallace pointed to her opposition to the Stimulus Package yet cited three letters she wrote to the Federal government asking for money for her state, saying the funds would help Minnesota's economy. A bit of a contradiction you say? Not to Michelle, who's argued that if the money's there for the taking, why should voters in her state lose out? But if she truly believed the Stimulus was a bad thing for the economy and would continue to rack up perilous debt for America, wouldn't it have been more politically expedient, and consistent, to refuse such funds? This is yet another example of the colossal hypocrisy of the Bachmann's, who've had no trouble over the years seeking government money for both political and personal use. And when Wallace, pointing to Bachmann's lone opposition to raising the debt ceiling, asked her about her seeming inability to compromise if she were elected president she offered that she'd hopefully be taking thirteen new Republican Senators with her to Washington for a filibuster-proof Congress. So much for compromise. Watching and listening to Perry and Bachmann's words and actions I wonder why they even bother pretending to like Democracy? Clearly, neither respects the notion of compromise, the Separation of Church and State, checks and balances, a free and open press, or the truth. Their brand of politics seems more fit for a despotic third-world nation. Speaking as a Texan who has endured the Perry administration all these years I can tell you there is no Texas "miracle" under Perry's leadership. It is no miracle that Texas has more low paying jobs, more uninsured children and families, more air pollution than all other states and on and on. And Michelle Bachmann has her degree from Oral Roberts University. That has less credibility than Jerry Falwell's college! I don't see how these people get taken seriously!